Ashley and LaNisha Davis were ready to become parents. 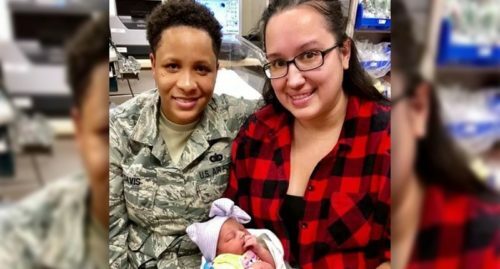 The Mississippi Department of Child Protection Services sent them a letter confirming their new daughter had been placed in their care, the biological mother had signed over her parental rights to the couple, and adoption proceedings were started immediately. Family and friends bought toys and clothes for the newborn. The couple visited their soon-to-be daughter and took photos together. And then a representative from CPS called to tell them that they would not be able to take the baby home. Forrest County Youth Court Judge Mike McPhail was denying them the opportunity. “You’re not going to get that baby,” the caseworker said with a raised voice according to Ashley. The excuse the judge used was that he wanted the baby to stay in Forrest County. CPS has a rule requiring foster children to be placed within 50 miles of the county the child is from. The couple live within 50 miles of Forrest County. LaNisha, however, is an active duty military member and the couple will be moving to New Mexico in May for her assignment. The CPS rule would not apply after the baby was officially adopted. “We already told them we would stay behind until the adoption is finalized. We would do anything we need to do. We would move into an apartment in Forrest County if that’s the case,” Ashley told the Clarion Ledger. She says the two weren’t allowed to argue their case before CPS administrators. Instead, the office stopped returning phone calls and wouldn’t meet with them at the local office. Dickinson is now the newly confirmed CPS Commissioner in charge of the agency that denied the couple their child.